Love cat facts and trivia? We have a page bursting with fun and interesting facts and delightful trivia about the felines in our lives. Lots of photos, cat facts and trivia tidbits to make you smile and appreciate that special cat in your life even more! Simple cat fact: Cats enjoy comfort! Your Cat Is Crepuscular. Well, Maybe. Maybe Not. Many (and perhaps most) house cats are crepuscular, which means they’re an animal that is most active at twilight (dawn and dusk). 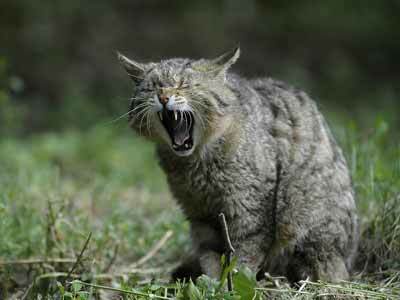 Most feral cats, on the other hand, are nocturnal, which means their highest level of activity is at night. 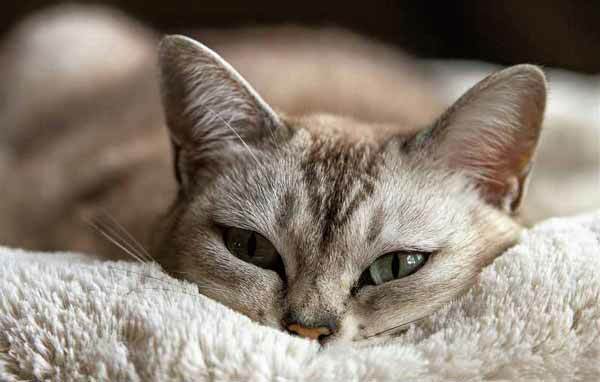 There are no hard and fast rules for any particular cat, though, so if your house-dwelling kitty attacks your toes more often in the middle of the night than at twilight, your cat just might be nocturnal instead of crepuscular. What most cats aren’t, however, is diurnal, which means their peak activity is during daylight hours. Daytime is a drag for most cats. They prefer to be active at twilight and night. Usain Bolt, the freaky-fast track star from the Caribbean country of Jamaica, set a world record by running 100 meters in 9.58 seconds during the 2009 World Championships in Berlin, Germany. This means his average speed was 23.35 miles per hour (mph), with his top speed during the race of 30 mph. This is extraordinarily fast for a human, with most of us never being able to come close to running at either of those speeds. So, how fast is a house cat compared to Usain Bolt? According to scientists, the average house cat (that’s the average house cat, by the way, not a world-class runner of a house cat) can sprint at a top speed of 30 mph. Which pretty much means most of our cats can run as fast as the man many consider to be the fastest human on record. Now, to be fair, 100 meters is a long way for Kitty to stay at top sprinting speed, so it’s likely Mr. Bolt would win if Kitty and Mr. B would compete over the full 100 meter distance. But the comparison does give us an interesting perspective on just how fast our average, pillow-snoozing house cats really are. 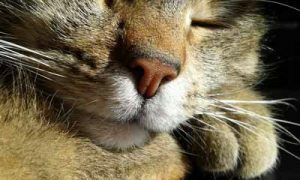 Your cat’s nose has a unique pattern, much like a human fingerprint. 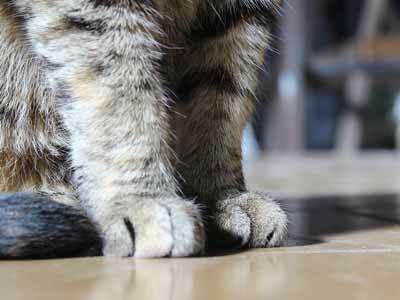 Cats can sweat, but only through the pads on the bottom of their paws. A look at the pads on the bottom of a cat’s paw. 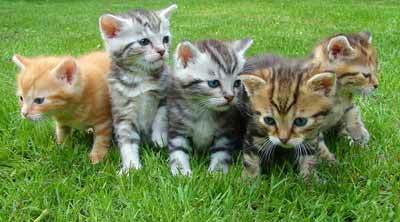 While a group of cattle and/or horses is called a herd, a group of cats is called a clowder or a glaring. During her heat cycle a female cat can mate with several different males. This means that it’s possible for the female to have a litter of kittens with several different fathers. Kittens from the same litter can have different fathers. 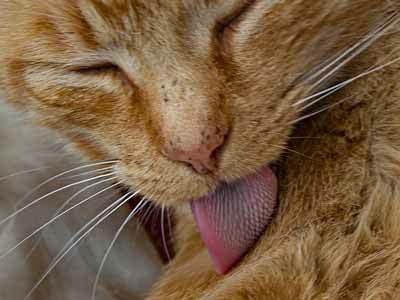 If you’ve ever been licked by a cat (and we’re guessing you have) you know how rough their tongue feels on your skin. That’s because a cat’s tongue is covered by “lingual papillae.” What is that? When referring to anatomy, the word “lingual” refers to something on or related to the tongue. The word “papillae” means a small protuberance on a body. So, “lingual papillae” refers to small protuberances on a tongue. There are actually four different kinds of lingual papillae. For the purposes of this bit of cat trivia, we’re interested in the “filiform” papillae. Lots of animals, including humans, have papillae on their tongues but a cat’s filiform papillae are special. The protrude from a cat’s tongue like backward-facing barbs, and are the reason a cat’s lick feels so rough. A cat’s filiform papillae helps a cat groom itself and its friends (including you) efficiently, and also helps with other things like stripping meat from the bone of its prey. Those little white dots you see on this cat’s tongue are the papillae. A “calico” is a cat with a spotted coat pattern that is a mix of white, black, and orange. Calico cats are almost always female, but in the rare case a calico is a male he is almost always sterile. 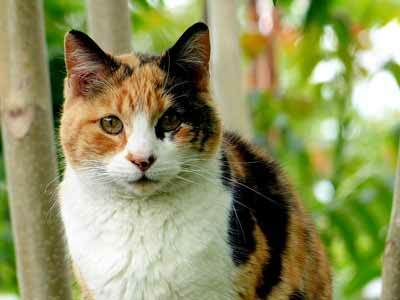 Some people are under the misconception that the word “calico” means a breed of cat. However, the work “calico” describes a cat’s color, not its breed. A calico cat showing the color pattern of white, black, and orange. An average cat (if there is such a thing), has approximately 244 bones. It’s difficult to say exactly how many bones any particular cat has because it can vary: Many cats have a tail, but the length can vary which will change how many bones there are in their body. Then there are the cats with little or no tail, like the Manx. And, just to complicate the bone count a little more, cats with extra toes (polydactyl) will have more bones than a cat with the typical number of toes (which, by the way, is five toes on each front paw and four toes on each hind paw). 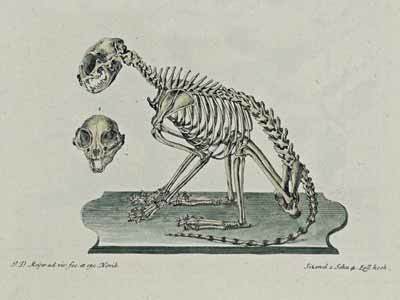 A 1748 drawing of a cat skeleton. A polydactyl cat is a cat with extra toes (we’re referring to “toes,” in this case, as a digit with claws). Cats with typical anatomy have five toes on each front paw and four toes on each hind paw. A polydactyl cat, though, has more toes on one or more of its paws than the typical number. Polydactylism is a congenital (present from birth) condition that is hereditary, so a cat with extra toes can pass the trait on to its offspring. 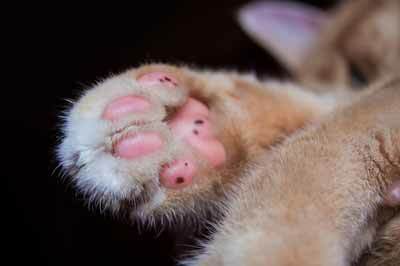 As we said above, most cats have fives toes (that is, a digit with a claw) on each front paw. It’s worth mentioning however, that one of these toes is a dew claw. A dew claw is located on the inside of the leg, and higher up than the other claws. Because of its location it doesn’t come into use when your cat walks, runs, or sharpens its claws. 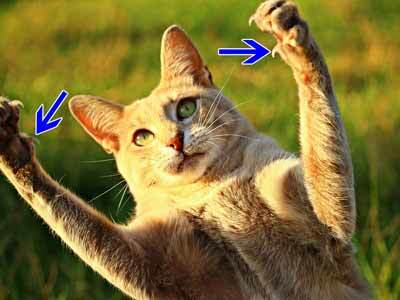 While a cat’s dew claws do come into use sometimes (such as when they grasp or hold onto something), this claw gets less use than the ones on the other toes. For that reason, dew claws should be periodically examined to see if they have become overgrown, with the claw possibly growing long enough to form a circular shape and grow back into the cat’s leg. If necessary, dew claws should be trimmed to prevent this from happening. A playful cat showing its dew claws. Cats have “protractile” claws, which means they can extend or retract them as the need requires. Commonly, their claws are retracted when they are relaxed, but are extended when they’re hunting, defending themselves, holding onto something, or sharpening them on their favorite scratcher. This holds true for most types of cats, big and small, but there are exceptions. For example, while lions and tigers have protractile claws, cheetahs do not: A cheetah’s claws are always exposed. 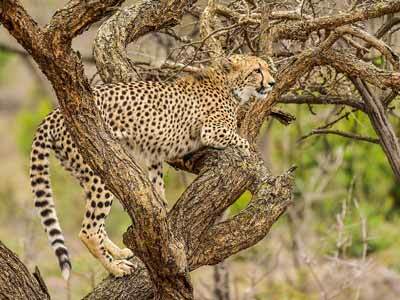 A cheetah in a tree. A cat’s molar teeth are sharp and serrated. Their marvelous molars are designed to rip, shred, and tear meat off of its prey and swallow it whole. In comparison, lots of animals like humans, horses, cattle, and more, have flat teeth made for grinding their food before swallowing it. 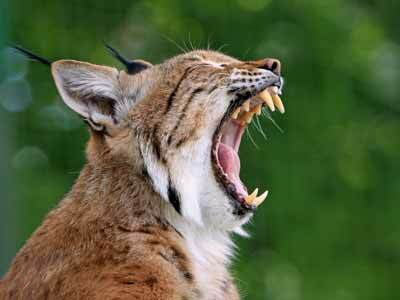 This yawning lynx shows its sharp, serrated molar teeth. Curious about cat whiskers? We have an illustrated article on cat whiskers here. An adult intact (not neutered) male cat is called a tom. An adult female cat that has not been spayed is called a queen or a molly. Immature cats are called kittens.